The lunar phase or phase of the moon is the shape of the illuminated (sunlit) portion of the Moon as seen by an observer on Earth. The lunar phases change cyclically as the Moon orbits the Earth, according to the changing positions of the Moon and Sun relative to the Earth. The Moon and the Earth are tidally locked, therefore the same lunar surface always faces Earth. This face is variously sunlit depending on the position of the Moon in its orbit. Therefore, the portion of this hemisphere that is visible to an observer on Earth can vary from about 100% (full moon) to 0% (new moon). The lunar terminator is the boundary between the illuminated and darkened hemispheres. 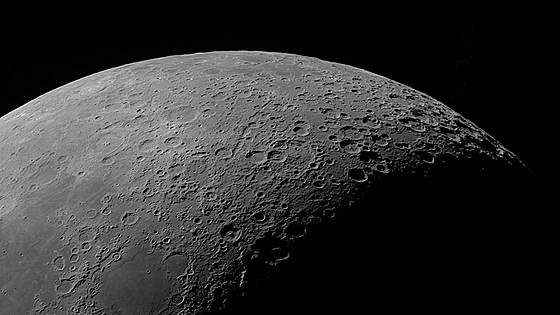 Aside from some craters near the lunar poles such as Shoemaker, all parts of the Moon see around 14.77 days of sunlight followed by 14.77 days of “night” (the “dark side” of the Moon is a reference to radio darkness, not visible light darkness).